Police Report is a document stating that the concerned person is not involved in any criminal activities. It is often known as character report or police clearance report. Police Report is a compulsory document if you are traveling to foreign countries or looking for foreign employment. A lot of Nepalese companies are also demanding police report for job vacancies these days. When you have provided all documents required to get police report, you will get police report in around 2 to 3 days. Visit Central Police Department, Rani Pokhari in between 10:00am to 2:00pm during Sunday to Thursday and in between 10:00am to 1:00pm on Friday to get police report Nepal form. The necessary or compulsory documents required to make police report are, original passport, original citizenship, passport photocopy, citizenship photo copy, paper ticket which worth Rs 10.� The police report form is available at the Central police department, Rani pokhari, Kathmandu. 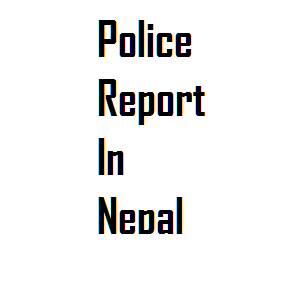 How to make police report in Nepal? First take the form from central police department, Rani pokhari. You have to fill the name and detail of country which we are travelling. You should fill your full name your father full name as well as your grandfather full name in the form as there will be the space to write all these things in the form. You have to verify documents from senior officer. After verifying from senior officer then the officer will look at your original documents as well as photocopy of those documents and verify that the documents are genuine or not. One the document are fully verified you will be provided with small sheet of paper in which there will be a number which means after which number is your turn or we can come according to the number given to us to collect our prepared report, as it may take time for complete report to prepared because the police officer should do study or enquiry about your behaviours, activities and so on. Remember to bring that sheet of paper at the time when you come to collect the report. Because there will be many people who visit there in order to make police report and they may not recognize each bad every person and they will� separate the �report or recognized it from the sheet of paper given to� you and if u forget to bring that paper sheet u may not able to collect your police report which� you have given to prepare, so it is necessary to bring that small sheet of paper in order to collect the police report. Why police report is important for Nepalese? Police report or the police clearance report is one of the essential, or we can say compulsory documents required for every person who are travelling abroad either for study or work. Police reports include each and every� detail about the person who have come to make it, as it give the information that whether the person has been arrested or not whether he/she has been involving in criminal activities or it provide information that whether he/she have been involving in any sort of police cases or not. So the police clearance report is an essential documents required for person who are travelling to abroad or it is also essential when are applying for any� government jobs, as well as jobs in banks, it companies and so on nowadays.